Loyalty marketing focuses on marketing to existing customers with perks and incentives to encourage repeat business, instead of solely attempting to find new customers. This type of marketing can be a powerful tool for small business owners who are trying to grow their businesses and increase revenue. It also generally costs less to keep current customers actively purchasing from you than it does to repeatedly attempt to bring in brand new business. There are many types of loyalty marketing programs you can use in your small business. Here are 10 ideas that will help you give loyalty marketing a try. One way to get previous customers back in the store is to offer limited-time giveaways. Try offering a free gift that promotes a new product to get the attention of past customers and encourage them to revisit and make another purchase. If you are selling software, a subscription service, a particularly expensive product, or a product or service that generally has a number of challenges to making the sale, providing a no obligation trial can be a great way to break through those sales objections. A members-only VIP club creates a level of exclusivity that can get customers back in the store again and again. Your VIP club doesn't have to cost your customers anything, and it doesn't have to be difficult or costly for you to implement either. You can offer VIP perks like new product previews, time-sensitive deals, an expedited checkout process, free samples and more. An effective way to encourage a purchase is by boosting the value of the purchase. Buy-one-get-one (BOGO) offers that promise customers something free or at a reduced cost are a popular way to pull in past customers and introduce them to new products. Many businesses, particularly in the food and beverage industry, use punch cards to track and reward a customer's patronage. The more purchases the customer makes, the more freebies they receive, making a powerful case for your customers to become frequent shoppers. Customer surveys are an excellent way to find out what your customers think about your business and what they would like to see more (or less) of in the future. There are a number of ways to get customer surveys in front of your customers; you can include a link or QR code on a receipt, you can send a postcard in the mail, or you can follow up on purchases with an email asking for feedback. Incentives can be as simple as an entry in a drawing for a giveaway or a store coupon. If you are selling software or another type of application that has regular updates that improve the user experience, offering free upgrades to the most recent version can be an excellent way to keep previous customers engaged in your business. If you have a customer database, you can use the information your customers submitted to provide perks that lead to loyalty. For example, consider sending out small gifts or greeting cards when your customers are celebrating a birthday or anniversary. This can also be a great way to build an email marketing list for your business--free gifts on special days in exchange for signing up for your list. Loyalty marketing can also extend beyond your business. 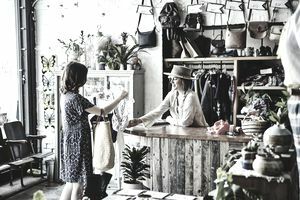 You can create partnerships with other businesses in your local area for cross-store discounts, shared promotions, and sales events that get customers into your store more often. Gamification--introducing elements of game playing into other activities--is an excellent tool for engaging your customers and keeping them motivated to purchase. You can create in-store scavenger days or raffles that can be entered by providing receipts for past purchases. You can even use digital gamification through location-based online check-ins and social sharing that allows customers to accumulate points that can be used in your store. Try these and other loyalty marketing incentives to bring customers back into your business to make repeat purchases on an ongoing basis. If you are able to incorporate some of these ideas into your business practices consistently, you may find that you are generating revenue from customers who have already expressed an interest in your business, instead of solely targeting new customers.